Laboratory and follow-up staff (those who communicate results to the medical community) from six states (MA, OH, TN, TX, VA and WA) attended a two and a half-day workshop in Albany co-sponsored by the Association of Public Health Laboratories (APHL) and the New York State Department of Health. Training was provided by the experts at the Wadsworth Center as well as four expert guest speakers. Discussion of procedures for referring infants for diagnostic testing at specialty care centers; review of diagnostic testing algorithms that referred infants undergo; and review of a series of de-identified cases that illustrated issues encountered during follow-up. Twelve-thousand of the 4 million babies screened positive for these conditions in the United States each year will grow up to lead healthy lives because of newborn screening. Without this testing, these same infants, most of whom appear normal at birth and whose parents are not affected, could suffer severe, debilitating conditions and even death. Because of the immense impact newborn screening has on public health, a panel of professionals continually evaluates conditions for addition to the Recommended Uniform Screening Panel (RUSP). Pompe disease Causes muscle weakness affecting skeletal, cardiac and respiratory function. If untreated, infantile-onset Pompe disease leads to death from heart failure in the first year of life. Adrenoleukodystrophy (X-ALD) Progressive metabolic condition affecting the adrenal glands and nervous system in males. Without treatment, individuals with the cerebral form of X-ALD typically survive a few years after symptom onset. Mucopolysaccharidosis type I (MPS1) Progressive condition affecting the heart, respiratory, brain, muscle, skeletal, and central nervous systems. Severely affected individuals lose basic functional skills, and usually have a shortened lifespan, sometimes living only into late childhood. 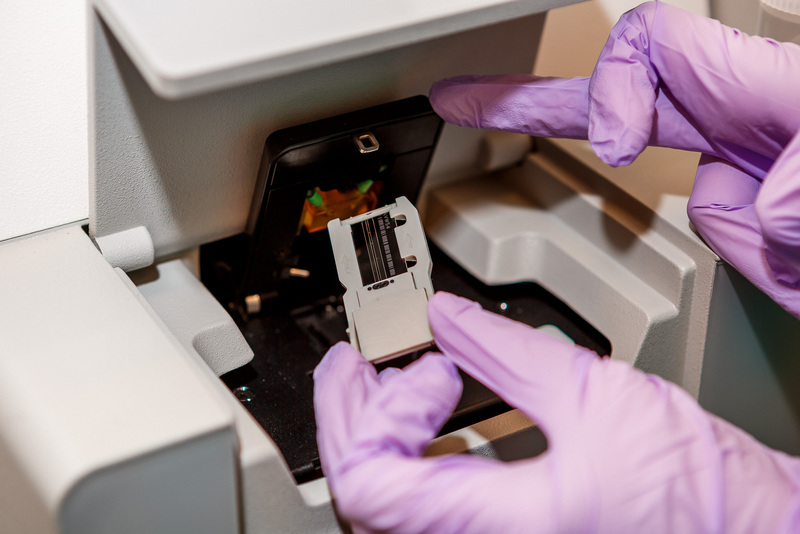 Once a disorder is added to the panel, laboratories must validate the test method, screening algorithms (a series of tests and decision points) and cutoffs. Laboratories then assess data analysis and interpretation procedures. But newborn screening laboratories do more than test. Because positive screening results must be confirmed, programs must quickly contact and communicate results to clinicians, so infants can be evaluated, and a final diagnosis can be made. All three disorders listed were added to the recommended panel over a year ago. Yet today only a handful of laboratories are performing these tests. New York was the first state to screen for X-ALD, and was one of the first states to screen for Pompe disease. It will soon screen for MPS1. In an effort to promote implementation, Wadsworth Center was designated one of three Peer Network Resource Centers (PNRCs), and awarded $120,000 over two years by the federal Health Resources and Services Administration (HRSA) to educate and provide technical assistance to other laboratories implementing these new tests. This effort is part of the HRSA’s larger, $4 million, New Disorders Implementation Project. This activity is supported by the Health Resources and Services Administration (HRSA) under grant #UG9MC30369, New Disorders Implementation Project for $4,000,000. This content is those of the authors and should not be construed as the official position or policy of, nor should any endorsements be inferred by HRSA, HHS or the US Government. Co-Sponsored by the Association of Public Health Laboratories and the New York State Department of Health.